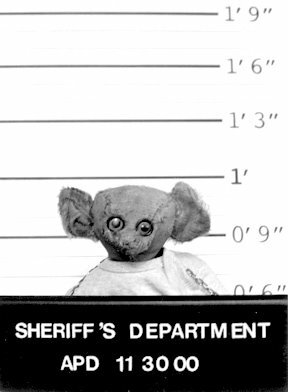 “This frightening photo, obtained by the Mega-News, shows the so-called Teddy Bear Terrorist in an apparently ‘wild’ state, according to a top member of the prosecution team, who spoke on condition of anonymity. ‘We see in this photo a criminal mind so ravaged by evil that it has reverted to a savage or animal existence,’ said the official. I have seen that before. Ignore the advert at the start, it's irrelevant. Winkie does not look like a terrorist hiding in the woods. She seems so vulnerable, just before the storm. Just like in the 1969 classic short “Bambi Meets Godzilla” I want to protect you Winkie. Winkie come home.! jack: we only wish the bear were as free as his video lookalike to scavenge in the greenish night. molly: as a teddy bear winkie understands empathy and surely would appreciate yours. Am I the only one who looks at that photo and sees Rousseau's noble savage? are you sure that the picture isn't winkie's evil twin blinky? 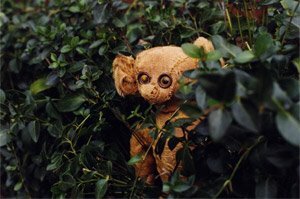 you can't trust the exurban mega-news; exurbia is full of evil stuffed critters but i always thought winkie lived in williamsburg or the lower east side. anonymous: the fwc makes no class distinctions between noble and common savages. bookfraud: though winkie himself is in jail, a chapter of the fwc is opening shortly at the williamsburg campus of sarah lawrence college. sarah lawrence college in billyburg? of what do you speak? why sarah lawrence? bookfraud: the w'burg campus is actually a continuing ed. playground. tuition is $2000 a month, or a one-time fee of $900,000. "Molly": grow up. grow up fast and get a life fast. I mean a real life. the little bear you love sooooo much and your other little furry animals and your Rousseau will not protect you. the terrorists don't discriminate, or not enough. "Molly": this is not a movie. This is real.